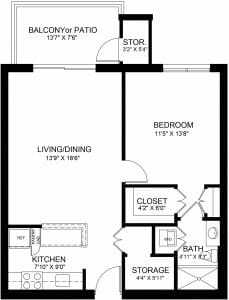 The value of a one-bedroom apartment home at Pennswood Village? A bigger lifestyle! The trend toward living in “tiny homes” is huge these days. So many people— from those just starting out, to retirees and seniors—are embracing the value of living in smaller spaces. Why? Because smaller space living frees up more time, energy and resources for experiencing life to the fullest! FAQ: What do my Life Care entrance fee and monthly fees go toward? Pennswood Village is a Quaker retirement community located in Bucks County, offering area seniors an active, maintenance-free retirement lifestyle in an inclusive environment. With exceptional services and amenities, and a full continuum of healthcare services, Pennswood is a nationally respected organization. Pennswood is also proud to offer a Life Care Contract, an agreement that guarantees residents priority access to multiple levels of healthcare services, such as personal care and skilled nursing, right on campus. When you become a resident of Pennswood Village, you will pay a one-time entrance fee that covers the cost of the residence and future healthcare services. Thereafter, you will pay for a monthly service package that includes the upkeep of your residence, the community and campus, dining services, housekeeping services, utilities and so much more — all of which contributes to freeing your time. 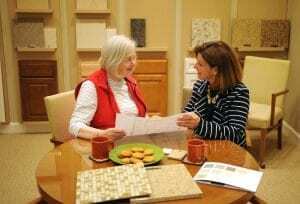 Anyone who is selling a house to move to a retirement community should know the importance of home staging. The process of home staging consists of simple changes and repairs that will make your house appeal to the greatest number of buyers. The goal is to create a space where buyers can imagine their own ideal lifestyle in the home. 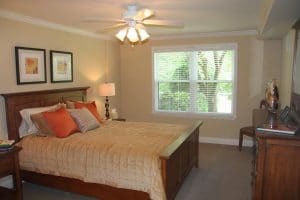 Staging a house can also help it stand out from other competition in the neighborhood, and the investment in staging is a lower cost than a first price reduction. It results in a quick sale, for the best possible price, meaning you’ll be able to begin your maintenance-free retirement community lifestyle sooner rather than later. 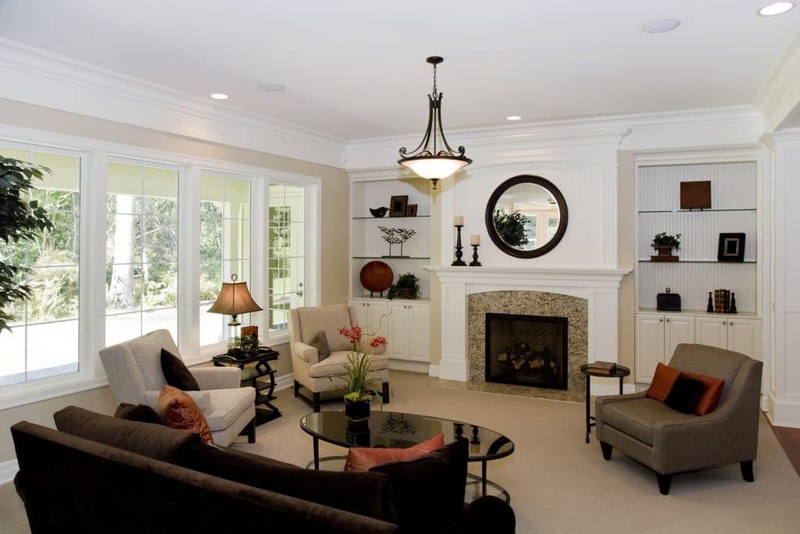 Changes can range from a few throw pillows and minor repairs, to repainting or rearranging furniture. As you begin to prepare your house for the market, follow these few tips to ensure a quick sale for a great price. When you move to a retirement community like Pennswood Village, you’ll want to take the time to reduce your belongings in order to gain an active, maintenance-free lifestyle. We refer to this process as rightsizing. It’s best to begin this process significantly in advance, so that you can complete the work in smaller portions over time to reduce any clutter or stored items throughout the house. Take a moment to reflect on the rooms you use in your house every day. You probably start each day waking in your bedroom, moving to the bathroom to get ready and then into the kitchen for breakfast. Maybe you spend some time in your living room watching a bit of TV or reading the paper before venturing out into your community for events, activities and errands. Now also take a moment to reflect on the number of daily chores and regular maintenance you must do, like vacuuming and dusting, yard work, cooking, cleaning and laundry. Would you say that these chores and responsibilities only apply to the spaces you’re using in your house? What if someone was available to take care of these excess responsibilities for you instead? Imagine if you no longer had to take care of these duties yourself, and only cared for the spaces you use on a daily basis, like your bedroom, bathroom, kitchen and living area. Imagine that you also had services to help you take care of these spaces, with just one phone call? How much time would that leave you with to do the things you truly want to do? Donna, working with Pennswood’s helpful staff, to make apartment home selections. “Whatever you want, that’s what it will be,” says Donna Bauman, Pennswood Village resident, about life at this Newtown, PA Continuing Care Retirement Community. Donna moved from a three-bedroom house in Arizona to Bucks County, Pennsylvania in early 2017 to be closer to her children and their families. Initially, she and her children considered sharing a home, but Donna insisted that she find her own apartment home at a nearby retirement community instead. 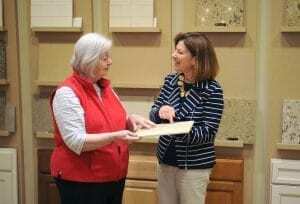 Donna immediately knew that she wanted to make Pennswood Village her home after staying two nights in a guest suite through the “Be Our Guest” program. The program allows prospective residents to get the full experience of life at Pennswood Village by staying in a guest apartment, spending time with other residents, and enjoying all the services and amenities the community has to offer. “I knew I was home as soon as I walked into that apartment. In fact, the guest suite I stayed in is my home now!” says Donna.